The San Francisco mayor wants to bring ocean-energy technology to the California coast, even if a San Francisco Public Utilities Commission-sponsored study ends up suggesting it doesn't make sense. San Francisco Mayor Gavin Newsom said he plans to pursue ocean-wave energy regardless of the conclusions of a still-to-be-released study ordered by the city’s public utility commission. "I don’t care what the study says," he said at a discussion with reporters Tuesday. "I just want the study to direct us in a better way." San Francisco-based consulting and engineering firm URS will conduct the study, which Newsom announced Tuesday, and assess the best time to harness wave-energy, the costs associated with transmitting energy from ocean to land and the efficacy of existing technologies, among other subjects. 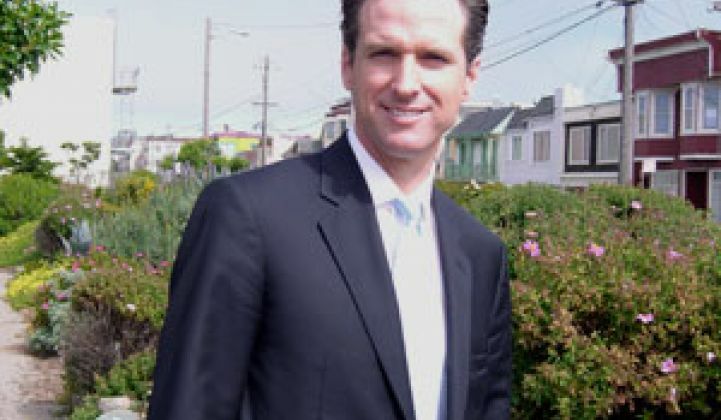 Newsom’s interest in wave energy hasn’t exactly been a secret. He promoted the potential for wave-energy technologies, as well as tidal-energy and geothermal technologies, at the Cleantech Forum last month (Gavin Newsom: ’We’re Still Playing at the Margins). Companies such as Canada’s Finavera Renewables and Scotland’s Pelamis Wave Power also apparently see the allure of wave power, which scientists say could potentially generate far more electricity than wind and solar power. Last year, the Electric Power Research Institute in Palo Alto, Calif., found that 10 percent of U.S. energy demand could be "credibly harnessed" from wave and current energy. But turning such optimistic statistics into reality has proved difficult. For one, whatever companies put in the water has to withstand the relentless beating the ocean can deliver. In late October, Finavera watched its wave-to-energy converting test buoy sink off the shores of the central Oregon Coast. The buoy, which cost about $2 million to develop and build, had been in the water for just less than 2 months (see Pulling Energy From the Sea). As a result of such hardships, the venture capital community hasn’t been eager to back the nascent sector. And at least for now, that’s OK with Newsom. "I’m not looking for VCs. We’re not looking for someone to make 20 percent [internal rate of return]," he said. "That’s not what this is about." Instead, Newsom pointed to government subsidies for other renewables and said he expects utilities, such as the Pacific Gas and Electric Co. -- which signed the first U.S. commercial wave-energy contract with Finavera in December -- and taxpayers to help foot the bill. He also has already received donations for his efforts to bring wave-energy to San Francisco’s coast, he said. Newsom knows his plan will be a tough sell, especially if the commission’s report comes back with negative findings. And that’s a possibility: The commission’s study on tidal energy earlier this month concluded that placing turbines in the waters below the Golden Gate Bridge would be too expensive. The ocean-wave study, which will cost about $100,000, is expected to be finished as early as May. Newsom said his hope is that he’ll never have to see another oil platform in his lifetime. "I want them all ripped out and torn down along the coast of California," he said, adding he wants to see wave-energy technology instead.